I first heard of the Cave Rescue Organisation call out when the late Barbara Green rang about 9.30 Sunday morning. She told me that Oggie and some other friends were thought to be in difficulties in Mossdale Caverns and that the callout was asking for people with knowledge of Mossdale Caverns. 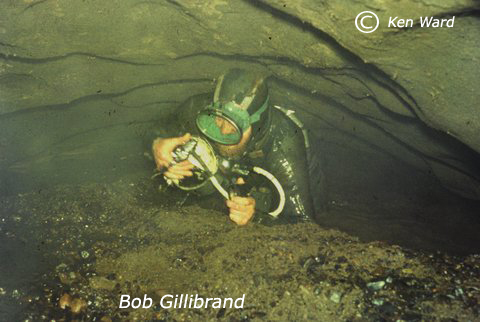 I had been with Ken Pearce and others a few years earlier when we took lead diving weights and digging gear as far as Rough Chamber to prepare for a later attempt. Owing to various commitments I did not take part on that trip and I learnt later it was foiled because of the weather. I drove up to Conistone and parked outside the then post office and set off up the track; on the way, I was picked up by a Landrover. On arriving at the cave I saw quite a few people in sleeping bags who had worked all night. I checked in at Cave mouth and mentioned I knew the route to Rough Chamber, but was told they needed people familiar with the far reaches of the cave. I worked on the site then for about one or two hours before being asked to take a reel of phone wire towards Rough Chamber with two others. I had only just got down the entrance when my light conked out. I decided to carry on, but then two guys coming towards us took the wire and went back into the cave. I came out with one of my companions. Next, I worked with George Houghton who was operating one of the JCB machines on the outer dam. He was trying to get large buckets of turf to reinforce the face as the whole dam was only a bank of peat and shingle, with any large stones and boulders that were unearthed placed in front. In the afternoon a party of us was up on top of the scar above the cave mouth, I cannot remember what we were doing; possibly rigging a communications aerial? When we got back down all work had stopped and people were gathered in little groups about the site. I spotted John Southworth and asked what was going on, he came over and said very quietly, that the lads had been found and they were all dead. At this stage, the Police Inspector in charge announced that all work was suspended until Monday morning. I went home on Sunday night and I was back at the cave at about 9.00 a.m. on Monday morning. I was a bit unsettled what with the bad news and also before leaving home I had rung my friend Les Lord, who after leaving Mossdale on Sunday had gone straight to work at Deerplay Colliery. It was a hard message to send when the police said no attempt would be made that day to recover the bodies due to weather conditions. I slogged about the site which was developing into a mud bath with all the 4 wheel drive traffic. About mid-afternoon shouts and noises came from upstream where the fire service had several Coventry Climax pumps working. When we looked, the pumps were being overwhelmed by the beck which had risen ten inches in ten minutes and was still rising. There was no rain where we were, but there must have been a storm on the fells above; panic and chaos. Jack Pickup commandeered about thirty of us to help pull George’s JCB free; he was working in two feet of water and was unable to see the deep hole that his machine had dropped into. He had two pumps in the front bucket and one in the Back actor; and was unable to push himself free. We pulled and the rope broke leaving us all on our backs, George ditched the pump in the Back actor and used the Back actor to free himself. Meanwhile, everybody was trying to raise the outer dam height, as the water rose higher a human chain filled and passed sandbags along the top of the dam. Authorities on the cave side of the dam could not see the water level in the outer dam and started remonstrating when the much lower inner dam was being ransacked of sandbags. We had to explain that if the outer dam went it would fill the cave again. The water was already up to the original dam top when the call came. As the search party was out of the cave we urged people to continue working at the dam; about an hour later the work was stopped while the dam was sorted. When I awoke, still on site Tuesday morning, the Army had sent engineers to lay metal track way on the disintegrating access track and provided hundreds of sandbags. The Army sandbags were much better than the county council ones which were treated with rot proofing which made them very stiff ,difficult to tie, and hard to tamp together. As a result, most of Tuesday was spent filling and reinforcing the dam with sandbags. A huge Ford Dutra 4 wheel drive tractor arrived ferrying, even more, pumps to the site. The station commander in charge was test running the pumps three minutes in every hour, very reassuring after the previous days scare. Also, the WVS arrived with about six field kitchens and distributed food for the two or three hundred people on the site. They were led by teachers from Eshton Hall with immaculate makeup at 6am in the morning! I was approached by Bob Leakey who wanted to get a team together to take a rope and start dragging the bodies out. I thought this would be organised by the authorities when Oggie was found. A number of search teams were being organised, and I was down to follow Brian Boardman’s team that evening if Oggie was not found, led I think by Randy Coe. Quite a few of us had been fixed up with lamps from Deerplay Colliery. The man in charge of the lamp room risked his job to send these via Les Lord; it would have taken days to go through the proper channels. However, the sad news came about one a.m. on Wednesday morning that Oggie had been found. All I can recall after this, that in the morning the Police Inspector announcing the decision not to recover the bodies of our friends and the escalating public money costs as the land owner wanted the beck reinstating to its original course. I remember when I got home I slept for nineteen hours.